The end, CINEMA mission – AIR & SSI Lab. CINEMA communication shutdown at 28th. Nov. 2014 . 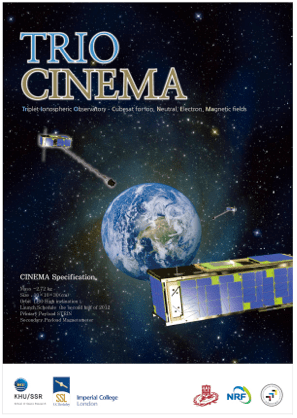 CINEMA is an international nanosatellite science mission of cooperative university institutions with the objective to provide critical space weather measurements, including unique high sensitivity mapping of ENAs (Energetic Neutral Atoms), and high cadence movies of ring current ENAs in stereo from low Earth orbit. By the selection of its sensor complement, the mission will pave the way for “magnetospheric constellations” with many satellites making multipoint observations. The project emphasizes student involvement with guidance by experienced engineers and scientists. The implementation of the project is realized using a combination of flight heritage and innovation that balances risk and safety. CINEMA is a triple CubeSat (3U) science mission of the following collaborating institutions (CINEMA consortium): SSR/KHU(School of Space Research/Kyung Hee University, Korea), SSL/UCB(Space Sciences Lab./University of California, Berekeley, CA) and ICL(Imperial College London). Within the CINEMA program, KHU and UCB will develop and fly three identical CINEMA nanosatellites, the constellation is referred to as TRIO-CINEMA (Triplet Ionospheric Observatory-CINEMA) to provide stereo ENA imaging of the ring current.